If you're a US investor, you have a lot to be grateful for: the economy is still growing and recession risks have receded; the unemployment level is below 5% and wages are rising again; the Dow Jones Industrial Average is at record highs; and home prices have recovered most of their losses as wealth has been rebuilt from the Great Recession. For most Americans, their wealth is held in the equity of their home and the value of their pension and 401(k) plans, both of which have been rising during this long enduring economic recovery. Seems like the good times are here to stay and getting better. After crossing the 20,000 mark on the Dow Jones Industrial Average, Barron’s recently proclaimed “Next Stop, Dow 30,000.” Euphoria is coming back into the markets again. 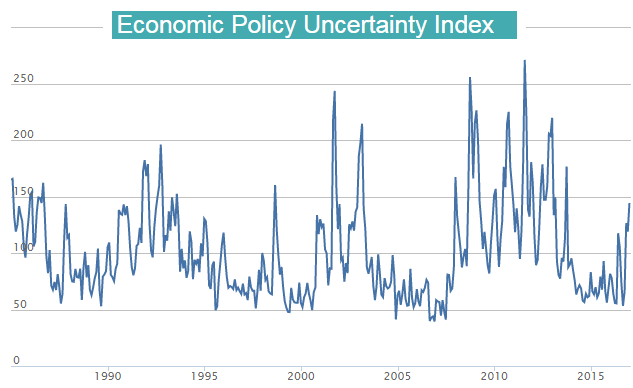 At the same time, we see one important index showing record levels of uncertainty. The so-called "Economic Policy Uncertainty Index" (see chart below) measures government policy changes, tax code data, and disagreement among economic forecasts. Ironically, it is rising along with record stock prices. Normally, this index is high when markets are volatile and when investors are—as the name implies—uncertain of what's to come. The US index has been out of step with the markets only three times in the past 25 years: 1993 before the Peso crisis, 1998 before the Asian financial crisis, and in 2010 ahead of the turmoil of the European Sovereign Debt Crisis and US debt-ceiling debacle. It is not just the index that is out of step with the rising market trends; several famed investors have also turned bearish or believe we are near bubble-like readings. Although he doesn't see the usual signs of euphoria yet present, noted bubble historian Jeremy Grantham, co-founder and chief investment strategist at GMO, recently stated that current market prices are somewhat of a “paradox″ and on “the statistical boundary of a bubble.” Grantham has had a prescient track record of calling bubbles ahead of Wall Street, doing so successfully in 2000 and again in 2008. Then there's George Soros, the billionaire hedge-fund manager who lost nearly $1 billion betting against the market’s rise after the election of President Trump. The stock market’s unforeseen and meteoric rise after Trump's victory has caught many a hedge fund and asset manager by surprise. However, a trend in place often remains in place until it is disrupted by another trend, and there doesn’t appear to be one immediately on the horizon. A number of savvy market technicians on our podcast—Robin Griffiths, Tom McClellan, Craig Johnson, Jonathan Krinsky and others—believe stock prices are more likely to head higher as trend investors follow the charts which point to the possibility of higher stock prices directly ahead in the short term. While the short-term trend in stock prices appears to be higher and investors remain sanguine about the US stock market’s prospects, longer term trends look less promising and indeed worrisome. GMO’s seven-year returns for stocks here and abroad remain negative outside a few select areas. The returns for bonds are equally as bad. The reasons are valuations. Stock market valuations as measured by the average of four valuation metrics are at record levels only seen in two other time periods, 1929 and 2007. This remains the third most expensive stock market over the last hundred years. The S&P 500 is currently trading at 21.23 trailing earnings, 18.35 forward earnings and the CAPE Shiller PE ratio is 28.24, the third highest on record. Historically, when stock prices remain elevated, bonds have traditionally been a safe shelter or preferred asset class to run to. The news here is also disquieting. Bond yields fell to record lows last summer when the yield on Treasuries and other sovereigns hit a low not seen in 5,000 years of recorded history. 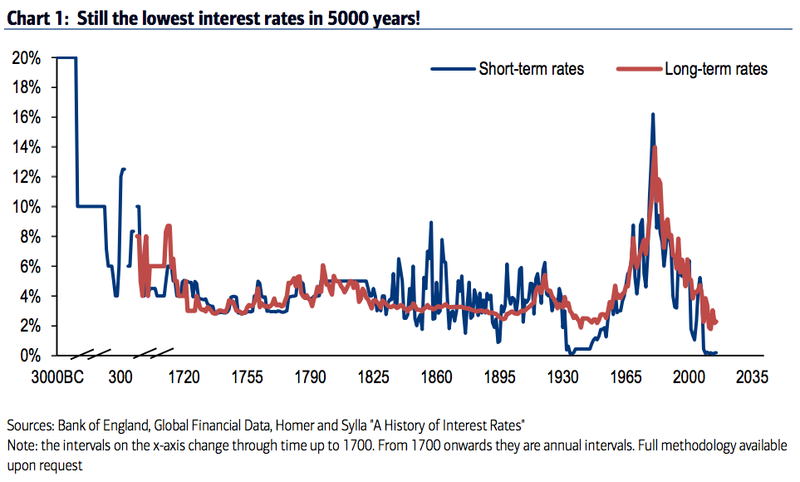 Throughout history, sovereign bond yields have ranged between 4-8%. Last summer they dropped across the globe with close to a third of sovereign debt carrying a negative yield and another third of sovereigns offering yields of less than 1%. I believe, as do others, that the 35-year bull market in bonds has come to an end. Individual investors have poured the bulk of their capital since this economic recovery began into bond funds or bond ETFs. Outside a brief blip during the taper tantrum of 2013, bond fund investors are not used to experiencing losses. Since yields on treasuries hit their peak in August of 1981, it has been a one-way ride to profits in interest returns and capital appreciation. I believe that ride is over and that the returns from bond funds (or individual bonds sold before maturity) are likely to be negative going forward. One reason is that yields are rising from such a low base. Using a bond duration calculator provided by the Wall Street Journal (see here), at today's current low yields, just a one percent rise in interest rates can have a dramatic impact on the prices of bonds going forward, with longer-duration bonds experiencing the steepest losses. Bond investors should take note that the Fed has embarked on a rate raising cycle and for the first time in nearly a decade is now talking about shrinking its balance sheet of $4.5 trillion. 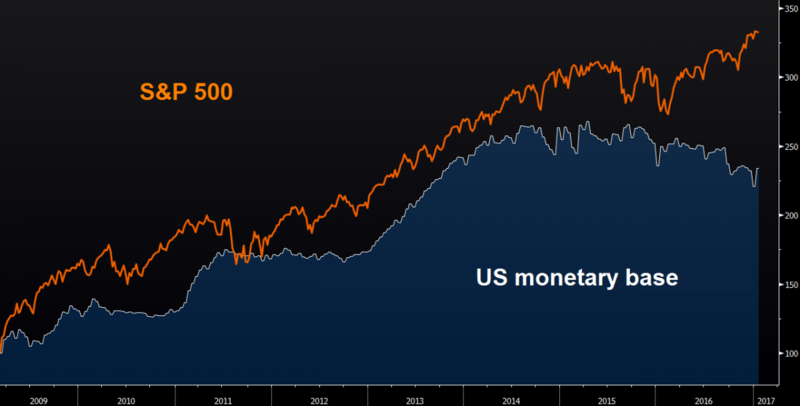 As shown in the next graph, the stock market is rising while the monetary base is shrinking. Part of this is technical due to new SEC rules, which make it more favorable to be invested in government money market funds. However, the talk and tone of recent Fed governors have turned more hawkish with the new mention of contracting its balance sheet for the first time in a decade. This adds a new tightening dimension to the markets. Contracting liquidity is not a good sign for either stocks or bonds. So what do present day market valuations and low interest rates mean for investors going forward? To put it bluntly, get used to lower returns with a high possibility of negative returns over the next 7-10 years. Two recent articles from Bloomberg support this view. In her article, The Next 10 Years Will Be Ugly for Your 401(k), author Suzanne Woolley points to a study done by Research Affiliates showing the returns from a portfolio made up of 60% stocks and 40% bonds, which is typical of most 401(k) plans and asset allocation models. The study showed a zero possibility of achieving a 5% annualized return over the next ten years. Even by changing the asset mix to favor undervalued emerging markets, short-term treasuries, or small cap stocks, the best returns were at best only 3%, not a healthy picture if you are basing your retirement on the typical asset allocation models of 7-10% annual returns. The expected returns of 3% mean individuals will have to work longer, change their lifestyle preferences, or move to cheaper locations to live. An additional study done by Sanford C. Bernstein & Co. suggests that the three-decade divergence between stocks and bonds may be coming to an end. Bernstein contends that the new era that is unfolding will be characterized by rising inflation and greater market volatility. Historically, the correlations between bonds and stocks have been negative until recently—an unusual occurrence. The analysts at Bernstein attribute the recent positive correlation between these two asset classes due to the disinflationary era of the past few decades. The implication for investors is that it will be harder to diversify against risk if both asset classes fall and volatility rises. The Bernstein study calls into question the traditional 60/40 split between stocks and bonds, which has worked remarkably well for the last 35 years. It also calls into question the current rage of passive index investing. Every bull market has its own unique fads and trends. Think tech and Internet stocks in the late 90’s, mortgage-backed securities, real estate and resource stocks in the last decade to today’s exchange traded funds (ETFs) and index funds. Individual shares no longer are the most actively traded securities in the market. They have been replaced by ETFs which have grown to a $3.8 trillion industry. While the new offerings of ETFs continue to expand, the number of new US-listed companies has declined significantly. With stock prices up almost every year for the last eight years and major indexes hitting all-time records, passive index investing has become the latest rage with investment models to robo advisors. The problem with many of these models is they may not hold up with stock valuations this high or interest rates this low. Most of these models are based on assumptions that have held up well the last 35 years when we have been in a disinflationary and declining interest rate environment. Long-term models still use returns for stocks and bonds based on 100-year returns where stocks returned 10% annually and bonds 5.5%. The problem for most investors retired today or nearing retirement is they don’t have 35 years much less 100 years to ride out the reoccurring bull and bear markets. Passive index investing has become this bull market's current rage. As Bernstein, Research Affiliates, and other recent studies have shown, this approach to investing along with the traditional 60/40 split between stocks and bonds may not hold up well in the macro environment of rising inflation, rising interest rates, and a reversion back to the historical norm of negative stock-bond correlations. Active investment management, which has been out of favor, may return once again as investors learn to zig and zag between rotating and volatile investment markets of the future where one is best prepared to navigate between feast or famine. Become a subscriber and gain full access to our premium podcast interviews with leading guest experts by clicking here.